Understand Pound-Volume Cost to Maximize Your Material. What is the real cost to make a widget? We want to share with you what is referred to as Volume-Pound Cost. When product engineers, developers, and inventors are looking at different materials to make their widgets it is common for them to compare the price per pound. It reminds us of the old adage comparing a pound of feathers and a pound of bricks. When compared a pound is a pound. The real question is which takes up more room? 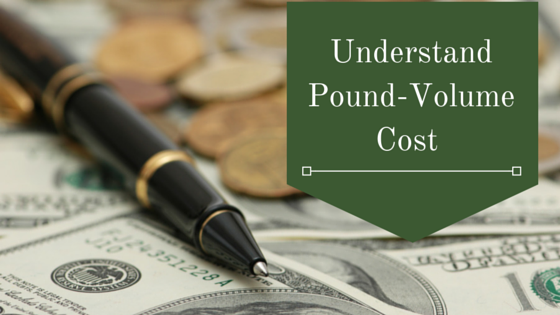 This is where understanding Pound-Volume Cost can come in handy. Understanding which takes up more space is helpful because in some cases you can make more widgets with less material. We will explain more on this in a bit. To demonstrate, we will work through a practical application. In our example, our widget will measure 1x1x1, and we want to compare 3 materials. Given 1 pound of material with different specific gravities we want to determine how many widgets we can make with just that 1 pound of material. Let’s assume that all three materials are priced the same and are approved materials to make widgets. The obvious choice would be to select the material with the lowest specific gravity. As we learned above, the lower the specific gravity of a given material the more space per pound it will occupy. We can make more widgets with fewer pounds of a low specific gravity material. What is the optimal material for us to make widgets out of? In our example, Material C turns out to be the BEST VALUE. Had we just compared price per pound we would have chosen Material B. 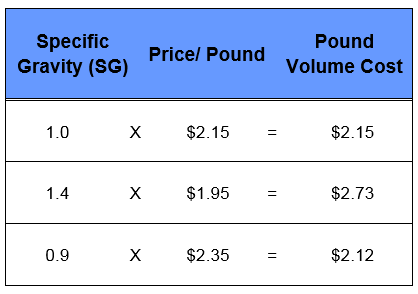 Had we just compared specific gravity we would have chosen Material C.
Taking into account both price per pound and specific gravity by looking at Pound Volume Cost we can see that Material C is the BEST VALUE. For more information contact us for our Pound-Volume Cost Guide. Learn more about specific gravity here.